Description: The first airplane set was the #183 - Play Family Fun Jet (1970-1980). That was replacedin 1981 with #182 - Jetliner (1981-1985), during which time Fisher-Price was also making the #933 - Play Family Jetport (1981-1985). 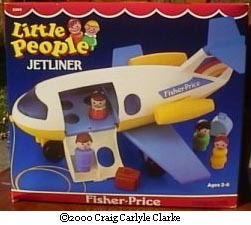 In 1986, Fisher-Price used the plane from the to introduce the #2360 Jetliner. They simply changed the plane's tail litho marking to 2360 vs. #933. The #2360 comes with blue and brown luggage pieces, and a family of 4, all with a "modern look" of plastic molded hair. FPT4513 - White top, Yellow bottom plane with a blue-tinted (enclosed) cockpit, Blue wings and interior, and Yellow engines. The plane has a fold-down door on the side with stairs to allow passengers access to the seats inside. Marked "FISHER-PRICE" (white within blue strip) on the back sides of the plane and a rainbow litho marked "2360" on the tail. FPT765 - The plane is pulled with a yellow plastic pull string that is attached to the nose. FPT302 - Light Blue round "hatbox" style suitcase. *See "Variations" below. AZPP - Dad - Blue body with brown molded hair. *See "Variations" below. HHPP - Mom - Yellow body, fancy eyes and a dark brown ponytail. *See "Variations" below. CIPP - Boy - Green body with black molded hair. *See "Variations" below. GEPP - Girl - Light red body with a dark brown sculpted bob. FPT4512 - The plane does not have a blue heat-stamped stripe on the side with "Fisher-Price" in the center. CYPP - Orange boy with brown plastic molded hair. HGPP - The yellow body mom could had also had a light brown ponytail. FTP305 - Dark blue round hatbox/luggage with a handle on top. Also see 1970-1980's #183 Play Family Fun Jet. Also see 1981-1985's #182 Play Family Jetliner.